Brrrrruummm – Fast racing cars & cars for small and big boys and girls-racing cars!!!! The racing cars can be painted in single or three colours. The files of the four motifs are included for a size as JPG, DXF file and Silhouette file (on request I will send you the files in SVG format for the brother plotter. You can also change the size of the motif/motifs-depending on what you want to embellish. A DIY file for cutting slides and paper with a standard silhouette or brother cutting plotter. With motifs made with this file/s you can pimp and beautify T-shirts, long sleeve shirts, but also bags, pencil, bags and Täschlein. You can also plot and apply wall stickers or Türsticker from vinyl foil, or make paper-cut personalized invitations – your imagination has no limits and each piece becomes a personally designed unique item. You can also use the plotted motifs to hide stains on clothing. The file is intended for private use and may only be used for commercial purposes up to a number of 15 plotted motifs – embellished clothing – Täschlein etc. You may of course give away or take advantage of yourself. If you want to use the files several times commercially you can purchase a commercial license-simply request if I have not yet set a website license for the corresponding motifs. This offer includes files for the cutting plotter and not a finished product. All rights to the graphics/Motivtexten remain with DerLilly Inh. Angelika Schmitt. The modification, copying and passing on to third parties is prohibited. The files are excluded from the return/Exchange right. The files can be downloaded immediately after payment via Fechtit as a "Zip file". It is not a pre-cut motif for ironing or gluing, but for a digital content! 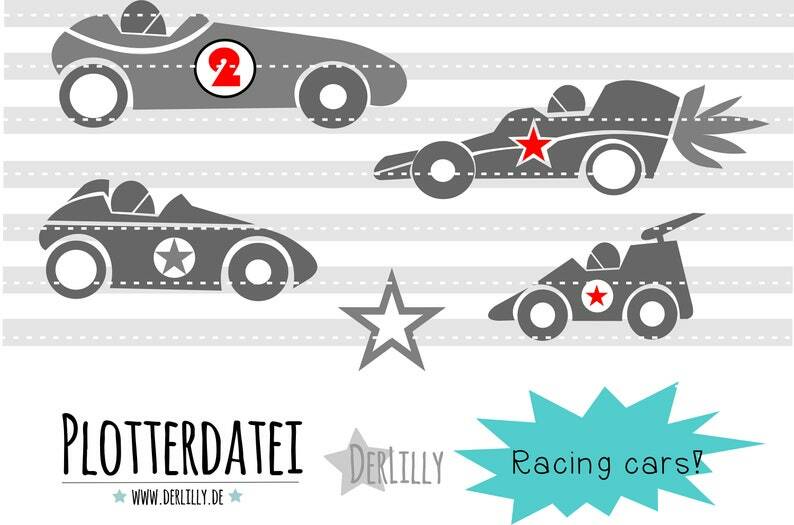 013 Plotterdatei Plottervorlage "Racing Cars"